Say what you will about French patisserie, I think German baked goods are king, and this book contains all the crown jewels. A recent publication, yet every culinarily-minded person I know already swears by this book. LUISA WEISS is a Berlin-born, American-Italian food writer who grew up eating warm Streuselschnecken on her way to school and believes dark winter days are best enjoyed whilst sharing Lebkuchen and Zimtsterne with family and friends. Luisa is the creator of the blog The Wednesday Chef and author of the lauded memoir, My Berlin Kitchen. Her work has been featured on Design*Sponge and National Public Radio and in Food&Wine, the Wall Street Journal, the Boston Globe, and Harper’s Bazaar Germany, among many others. She lives in Berlin with her husband and son. "Even if you don’t have the stamina for homemade apple strudel or Black Forest cake, this Berlin-born food blogger will win you over with her sandy almond sugar cookies." "This overdue guide is a happy marriage of European craft and American sensibilities." "As an expat American, Weiss has a sense of discovery that permeates her book, giving a sense of wonder and appreciation to the sometimes complicated recipes. It’s just the right sensibility, and it makes for a cookbook that’s not only useful and instructive but charming." "Berlin-born food writer Weiss (My Berlin Kitchen) collects masterpieces of time-tested recipes to create this traditional classic that, like her lebkuchen (old-fashioned German gingerbread), is bound to stand the test of time and taste. [...] Collected from various places and people—whether it’s a cookbook or from her German assistant—this cookbook presents a beautiful piece of German tradition." 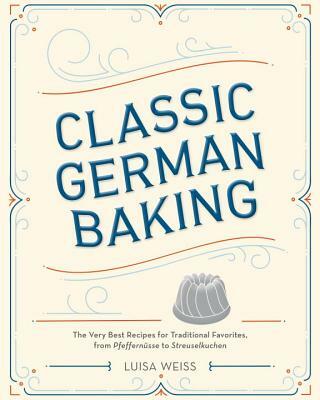 "In Classic German Baking, author and former cookbook editor Luisa Weiss surpassed those expectations with an engaging, precise, and pitch-perfect collection of more than 100 recipes that deserve to be better known in the U.S."